REVIEW: Alonzo King/LINES at Modlin; and Dance Theatre of Harlem at Richmond CenterStage | Dance | Style Weekly - Richmond, VA local news, arts, and events. A look at two shows last month that stood out in the dance world. Alonzo King wants us to know that everything we dream about dancers is true. Gorgeous, unearthly beings, they carve air, move light. They are both like and unlike us in their profound, rarified humanity. In all three works (all choreographed by King) on the Oct. 1 program at the Modlin Center for the Arts, King’s dancers mesmerized. Evanescent in spare costumes and gold light, they sliced and curved, uncurling and re-spooling, compelling in their preternatural clarity of line. Each dancer electrified the space around them. In the first work, “Concerto for two violins,” set to the music of Bach, the dance breathed and swung, following the music’s organic path. But partway through the second work, “Men’s Quintet” (an excerpt from “The Radiance of Convergence”), it grew apparent that King’s movement remained consistent in shape, tone, and dynamic, despite different music and costumes. In this and all the works, dancers walked onstage, paused, threw themselves into intricate, curvilinear orbits around their own spines. As studies in energy, they embodied electrons throbbing, scintillating in space. But they remained strangely isolated. They never actually traveled much through the space, and so the space never really coalesced around them. And while it was a great pleasure to watch these dancers move, it would have been an even greater pleasure to learn something more from them than beauty and energy -- something about being vulnerable, messy, ecstatic -- human. On Oct. 10, Dance Theatre of Harlem returned to Richmond after over 20 years, the last nine of which the company was on hiatus. The return layered victory upon victory -- DTH was back up and running and they were here in Richmond. This show was a big deal. Mayor Dwight Jones came out from behind the curtain on the Carpenter Theatre stage and said as much. The audience, buoyed by excitement, cheered him and, at every opportunity, the dancers themselves. Dance Theatre of Harlem was founded in 1969 by Arthur Mitchell, the first African-American principal dancer with New York City Ballet, and Karel Shook, in order to add the voices of black dancers to classical ballet which still has “a lily white reputation,” as Joseph Carman noted in the June/July 2014 issue of Pointe magazine. So when the performing company went on hiatus in 2004 due to financial issues, a bright star dimmed. Back in action since April, 2013 under the artistic direction of Virginia Johnson, who performed with DTH for 28 years, the company has been touring with a young crop of dancers. While still coming into their own, most of these dancers are assuredly well on their way. The Richmond program included three works from the company’s repertory. “Gloria,” choreographed in 2012 by Robert Garland to choral music by Francis Poulenc, pays homage to the spiritual legacy undergirding the culture of Harlem in a cleanly constructed, classical work for the entire company. A celebratory closing featured children from the School of the Richmond Ballet, children walking toward the light as the company knelt down to watch them go. Ulysses Dove’s “Dancing on the Front Porch of Heaven: Odes to Love and Loss” (1993) gave the dancers in striking white unitards a chance to dig – meeting and parting, taking deep second position pliés, long lines extended then broken, with crystalline moments amid the solemn chimes of Arvo Pärt’s “Cantus In Memory of Benjamin Britton.” Most memorably, a woman ran upstage, jumped into a single tour straight as a match, and was arrested in space by her partner’s catch in a lift so simple, so perfectly timed, you caught your breath in love and gratitude. 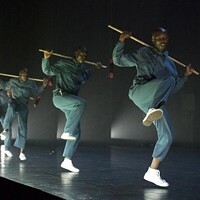 Robert Garland’s “Return” (1999) closed the show with a lively series of vignettes melding ballet with urban/street idioms, to the music of James Brown and Aretha Franklin – a surefire way to get the audience on their feet and cheering. By the end we were all hoping for another “Return” soon of the Dance Theatre of Harlem back to Richmond. Twenty years is way too long.